I have now all my movie clips moved to my external harddisk following hints from this article. Before that I created a 250G partition for data and left the rest for time machine backup. Next would be moving my musics this post would be steps to follow. I noticed the other day that my MacBook harddisk has only twenty something Gb left so I have to move clips and music to external storage. As you have ignored me for nearly 48 hours now I’ll be submitting Service Termination Request Form today. …. I have checked the record and would like to let you know that the service that you are now subscribing do not bind with any commitment. Sorry you guys are too slow and I have submitted termination request already. If you can offer good mobile broadband plan please let me know by return I’m too dumb to understand why Netvigator likes to punish loyal customer, how many years I have been with you, tell me? 22 hours ago I emailed Netvigator customer service and almost at the same time clicked at their Netvigator and SmarTone-Vodafone websites such that someone will contact me. I got a call from Netvigator within couple of hours from a sales who couldn’t convince me why as an existing customer I have to pay more keeping the broadband at home while going mobile. Are there many people out there connecting full time via fixed line at home while taking their notebook outdoor surfing at the same time? To illustrate, say I’m paying $198 for my home broadband but it isn’t used while I’m away, Netvigator knows that don’t they because they must have utilization records in their database. They could apply that diversity and oversell can’t they? 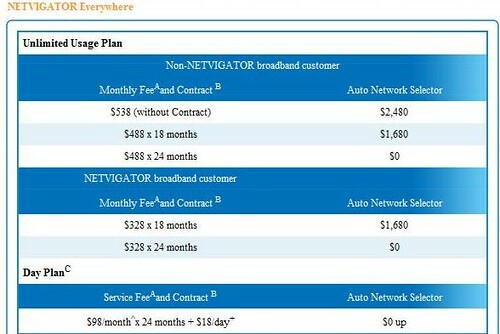 If I go for their ‘Everywhere’ plan I have to commit to a 18 months contract at $328 per month which equals to $526/month plus costs of $1,680 for the USB ‘auto network selector’. If you are new customer, for exactly the same thing, you only need to pay $488 for a 18 months commitment and $488 for 24 months and the dongle is free. Why do they punish loyal customers? Do they expect me to run my own server at home and get connected round the clock? Vodafone isn’t very good either so far I have no phone call or email contact from them. [edited] they did come back about 24 hours later forwarding their standard ads without any human touch. Just don’t laugh at me you’ll know this isn’t easy when are at my age! Nobody has full control of his/her life style because we are not living alone in an island. I need a healthier life style with more exercise. I drive to work which I don’t need to because I’m not living many miles away from office. I have tried a few times taking underground home which wasn’t difficult. So why do I still drive to work, it’s free to me and laziness is the only answer. However I may need to invest in an ‘in-ear’ earphone since I can’t really listen to my iPod while traveling on the train. Driving up the volume will surely cause another problem. (1) isn’t sustainable because winter is approaching (2) is possible but I need life style change, i.e. sleep early (3) I’ve been doing that from time to time (4) not sustainable, may fail easily and money down the drain. My plan now is going for (2) hence I need to adjust my life style. I’ll have to stop watching late news before sleep and try getting up early enough perhaps once per week at the beginning then increase the frequency gradually. There are quiet hilly walk with very little traffic where I could walk for 30 minutes or so in the morning. Can you confirm that I’m currently not tied to any contract/commitment and I can cancel my broadband account without penalty? I wanna go mobile broadband but your plan sounds ridiculous to me since I must be a home broadband user to enjoy it but who needs both? Look forward to your confirmation ASAP. I’ll see what they’ll say to me.